This is one of my all-time favourite comfort foods. 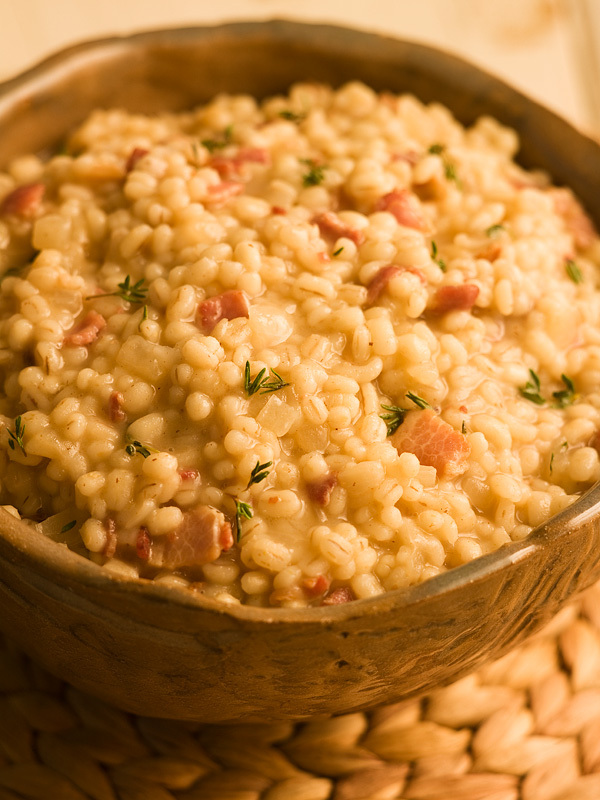 Just like high-starch rice, barley may be simmered and stirred into a smooth, creamy risotto, absorbing the flavour of the bacon and rich chicken broth as it slowly cooks. The results are richly flavoured and deeply satisfying. Pour the chicken broth into a stockpot and bring to a very slow simmer over medium heat. Meanwhile, in another saucepan, fry the bacon over medium-high heat until it is crisp and golden brown. Pour off about half of the fat. Add the onions and garlic and sauté them for a few minutes until they’re translucent and soft. Stir in the barley and continue cooking, stirring constantly until the grains are well coated with oil and slightly toasted, about 3 minutes. Pour in the wine and continue stirring as the barley quickly absorbs the liquid. Begin adding the heated stock, 1 cup (250 mL) or so at a time, stirring constantly to allow each addition of the liquid to be absorbed by the barley before adding more. Because the broth is already hot, the temperature of the barley will stay consistently hot, which, along with the constant stirring, encourages the release of the starch in the barley. In turn, the starch thickens the surrounding liquid and makes it creamy. Continue stirring in the hot broth until the risotto is tender and creamy. 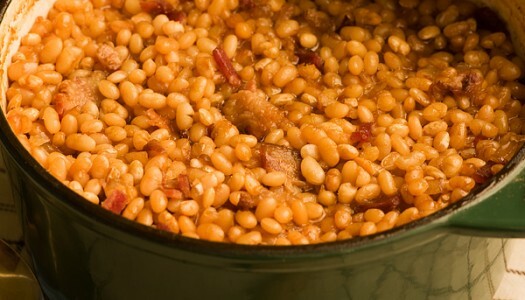 Taste frequently to judge the doneness of the barley grains. It will take about 45 minutes from the time you add the first broth until the rice is done. Season with salt and pepper and stir in the thyme and cheese. Serve immediately. Try adding a handful of your favourite herb instead of the thyme. Chives, green onions, parsley and rosemary all work well. If you run out of broth, you may use simmering hot water. This risotto-style cooking method is also great vegetarian style, without the bacon and the chicken broth. Beans have the wonderful ability to absorb lots of flavour while they slowly bake. They’re nutritious, tasty and easy. 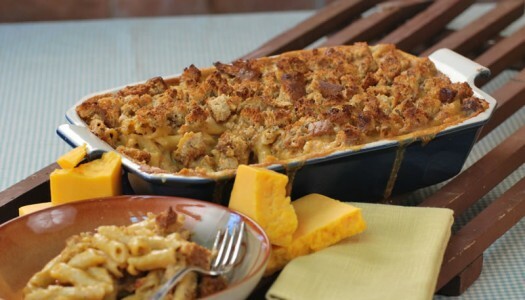 There are few things more comforting in the kitchen than an old-school batch of mac n’ cheese. Ooey gooey goodness. Perfection—almost—I mean have you ever added bacon to your mac n’ cheese? If your house is anything like mine, they’ve already smelled the bacon and are lined up, waiting to share!